The 2017 E3 Business Awards evening took place on Thursday 13th July at the Macron Stadium in Bolton. 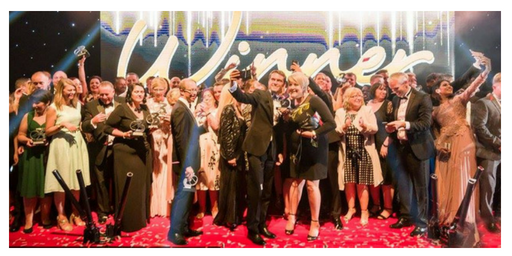 The winners were announced in front of an audience of over 500 business delegates from across the North West. There were seventeen award categories in all. To secure their places, all the finalists had been judged by an independent panel of twenty-three business managers, entrepreneurs and support professionals. In a two-stage process, the panel evaluated the initial written submissions and then held interviews with each of the shortlisted candidates. Speaking on behalf of 1 Events Media, Managing Director Mubarak Chati thanked the judges and paid tribute to the “invaluable contribution that businesses, charities and entrepreneurs make to our region’s communities.” He said: “Not only do they help to drive economic growth, they deliver important social benefits too. They create jobs, they provide training and, they support local supply chains. The winning companies and individuals came from organisations across the North West, from Cumbria to Cheshire, Merseyside to Manchester. The E3 Business Awards are part of a programme of events that seek to help the region’s businesses to build links and strengthen the North West economy. Next on the calendar will be the E3 Business Expo, which will be held on 14th March 2018, also at the Macron Stadium. Next year’s E3 Business Awards will take place on 12th July 2018 at the same venue. Nominations will open on 8th January.